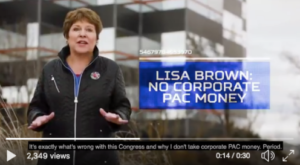 ECU endorsed candidate Lisa Brown (WA-05) has released a new ad spotlighting her commitment to curbing the influence of Big Money in Congress and her decision to reject corporate PAC money. Brown’s ad comes after the opening of the Congressional Leadership Fund’s (CLF) new field office in Spokane. The Super PAC, aligned with Speaker Paul Ryan and funded largely by secret “dark” money groups, plans to spend $100 million this election cycle and has backed Brown’s opponent Congresswoman Cathy McMorris Rodgers. McMorris Rodgers was named to End Citizens United’s Big Money 20, a list of Washington politicians who put the interest of their big donors ahead of the interests of the American people.